Clogher Excavations Pty. Limited is a family owned civil engineering contractor specializing in the construction of pipe lines for stormwater drainage, watermain, sewermain, pump stations and associated civil and structural works. The company maintains its corporate office and construction yard at Guildford NSW. Various types of project undertaken are construction and relocation of underground services for construction of Highway, Upgrading of Highway, Housing, railway projects, water supply projects and many others. 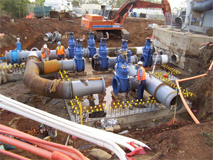 Clogher Excavations undertake works mainly around Sydney and regional NSW as well. The company has a specialized workforce which utilizes company owned plant and equipment. Staffs are trained in the requirements of technical standards and have undertaken specialized course such as confined space, pipeline construction courses and others that are necessary to undertake company works. Our aim is to demonstrate and ensure safety, environmental and quality compliance in accordance with AS/NZS 4801:2001, AS/NZS ISO 14001:2004 and AS/NZS ISO 9001:2008, the standards specified in relevant contracts, codes of practice and all relevant Acts, Legislation and Regulations.